GM executives have told suppliers to prepare for sales in North America of 250,000 new Malibus a year, 25 percent above last year's levels. DETROIT (Reuters) -- The Chevrolet Malibu has been a symbol of General Motors’ competitive woes for nearly 20 years because of designs that critics often lambasted as boring. Now, the No. 1 U.S. automaker is telling suppliers a redesigned version of the midsize sedan will deliver a long-awaited sales jolt. GM executives have told suppliers to prepare for sales in North America of 250,000 new Malibus a year, 25 percent above last year’s levels, and have the ability to go as high as 300,000 cars a year, according to three supplier sources familiar with the plans. GM declined to discuss forecasts, but last fall the company told analysts it was targeting 2016 sales of 225,000 Malibus a year. 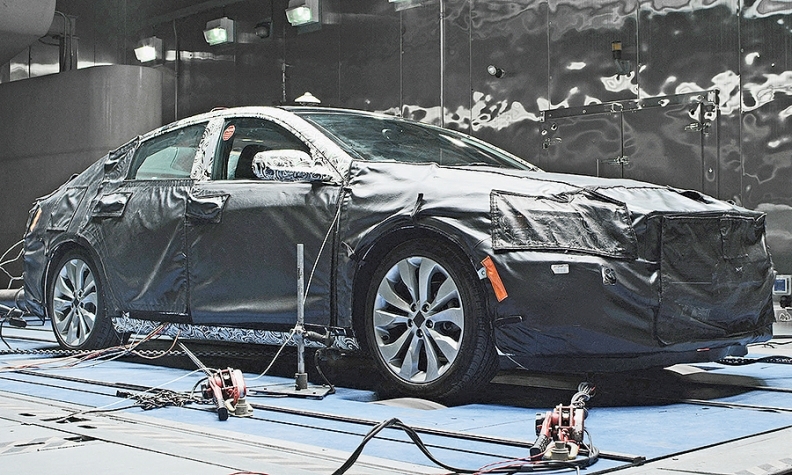 Company officials say they expect the new Malibu to deliver $1,500 a car more profit than its predecessors. Taken together, the projections indicate GM is hoping for at least $450 million in additional profit from the car, which will be formally unveiled at the New York auto show next week. That profit would be equal to 41 percent of GM's most recent quarterly net income. To win over skeptical consumers, GM's ads for the new Malibu will tout the car's quality, styling, fuel-efficiency and myriad safety and connectivity features. GM's sales goals for the Malibu are important, because the car is a key piece of CEO Mary Barra's strategy for delivering 10 percent profit margins in North America, and return on capital of 20 percent globally. But to hit its targets, GM will have to overcome a legacy of playing catch-up in a segment crowded with strong entries, including longtime segment leaders, the Toyota Camry and Honda Accord. GM's Japanese rivals also benefit from the cheap yen to help defend their dominant market shares. "If you're going to beat the champ, you can't just win on split decision," said Steve Hurley, owner of Stingray Chevrolet near Tampa. "You've got to knock him out. That's what the Malibu has to do." The current car is profitable, GM officials say. But it lags the competition by various measures. Over the last five years, GM has spent an average of $801 a car promoting the Malibu, according to data compiled by Kantar Media. Honda has spent an average of $539 a car touting the Accord, and sold an average of 60 percent more sedans a year. GM executives say they see opportunity in markets including Los Angeles, where the Malibu's share is only 1 percent. "Let's be realistic," Chevy director of car marketing Steve Majoros told Reuters. "We're sitting here in seventh or eighth place. We have tremendous opportunity to grow." GM has had ambitious targets for the Malibu before and fallen short. LMC Automotive forecasts Malibu U.S. sales just breaking 200,000 in 2016 before sliding back under that total the next four years. IHS Automotive has the car in the 200,000- to 210,000-vehicle range going forward. "The car was never competitive with its peers," auto analyst Maryann Keller said. "It always seemed to be a generation behind." The Malibu name goes back to the mid-1960s, and was associated with a popular line of muscle cars in the late '60s and early '70s. In 1997, GM revived the Malibu after a 14-year hiatus as a plain-looking, mainstream, front-wheel-drive sedan aimed at Camry and Accord. Since then, Malibu sales have lagged well behind those rivals. Despite high marks for quality on several surveys, Malibu last year was the only vehicle in the U.S. midsized car segment's top eight sellers to suffer a sales decline. It ranked ninth in 2014 among midsize cars most seriously considered by consumers, said research firm Strategic Vision. The Malibu, which sold last year at an average price of about $21,500, also competes against the Ford Fusion, Hyundai Sonata, Nissan Altima, Chrysler 200 and Volkswagen Passat. "If you add up all of the sales objectives of all the different nameplates, it's probably twice as big as the segment itself," said Derrick Hatami, Nissan division's vice president of U.S. sales. "Everybody's got very lofty objectives."